Katie and Peter have known each other since preschool- they just didn’t know they did until Peter’s mom was going through old photos and found his preschool photo. It just happened to have Katie in it too! They met again years later at a gym and fell in love. We were able to photograph Katie and Peter’s engagement session a few months ago and got to know them! We had a great session and couldn’t wait for their wedding day! Getting ready for your wedding is one of the best parts! The make-up, hairstyling, primping and beautifying are what it is all about! Katie had the best of the best on her team. Flawless Faces in Costa Mesa took care of Katie’s hair and make-up. Carina is an expert at making a bride look her very best for her wedding day. 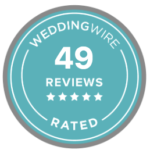 We have never seen a bride unhappy with Carina and her team’s work. Katie wore a beautiful white mermaid gown by Maggie Sottero. It had a sweetheart neckline, embellishments below the waistline and a GORGEOUS corset back. Her hair was pulled to one side and adorned with a silver floral hair comb, finished off with a beautiful tulle veil. Her silver shoes were made by Nina. She was a picture of perfection! The bridesmaids wore soft aqua blue chiffon dresses with sweetheart necklines by Mori Lee. Katie and Peter had their first glance at the Heritage Hill Historical Park in Lake Forest. We LOVED this location and thought it was perfect- especially with the colors Katie chose for her bridesmaid’s dresses and her bouquets. The pepper trees make for such a lovely backdrop with their flowing branches and draping leaves. The flowers by Pocket Full of Petals were a perfect accent to the beautiful bride and bridesmaids! The bride carried a bouquet of soft peach garden roses, spray roses, white hydrangea and white stock with pretty accents of dusty miller for a soft silver touch. The bridesmaids carried hand tied bouquets of peach roses, pale pink and peach stock, white hydrangea with little touches of silver as well. Katie and Peter’s wedding at Tivoli Too in Laguna Beach, CA by Gilmore Studios from Gilmore Studios on Vimeo.